One of the most confusing aspects of portable oxygen concentrators (POCs) is the pulse settings. Are they the same as continuous flow settings? Is there a difference in the setting from one POC to another? I am going to provide a detailed response to these common questions. Be warned! Since this is such important information, this post is longer than usual because I wanted to be sure all the information is in one place. On an oxygen cylinder or home oxygen concentrator, a setting 3 LPM provides 3 liters per minute, or 3,000 milliliters, of actual oxygen output. However, the average breathing rate is 20 breaths per minute, or once every 3 seconds. Therefore, an oxygen user only inhales about 1/3 of the output, or 1,000 mL. The science and math behind an oxygen conserver recognize that 2/3 of the oxygen is wasted, so if it is provided only when the user is inhaling, the oxygen can be conserved. When an oxygen conserver is used on an oxygen cylinder, it simply makes the oxygen last longer; when put into a portable oxygen concentrator (POC), it allows the unit to be smaller and the batteries to last longer. The amount of oxygen output and actual amount a patient receives on the various pulse settings depends on several factors. The first is the conserving ratio of the conserver that is used. Conservers use a 3:1 to 6:1 ratio, with the 3:1 ratio providing the largest amount of oxygen, and 6:1 providing the smallest amount of oxygen. When a conserver is used on an oxygen cylinder, a 3:1 ratio will allow the cylinder to last 3 times longer; a 6:1 ratio conserver will allow the cylinder to last 6 times longer. Seems pretty straight-forward, but it gets more complicated. Pulse – this method delivers a fixed amount of oxygen each time it detects inhalation. As soon as it delivers the oxygen, it stops until the person takes another breath. All electronic conservers use this method of delivery. Demand – this method delivers oxygen as soon as it detects inhalation and then uses continuous flow until the user exhales. Dual-lumen conservers use this delivery method. Hybrid – this method delivers a pulse at the beginning and then uses declining continuous flow until the user exhales. Many pneumatic conservers use this method. Minute Volume – this method delivers a fixed amount of oxygen per minute. The amount of oxygen delivered with each breath depends on the breathing rate of the user. Slower breathing rate equals larger amount of oxygen per breath; faster breathing rate equals smaller amount of oxygen per breath. Uniform Pulse – this method delivers the same amount of oxygen with every breath, regardless of the breathing rate. Slower breathing rate equals less oxygen over the course of a minute; faster breathing rate equals more oxygen over the course of a minute. Now let’s look at popular portable oxygen concentrators. First, some POCs provide both continuous and pulse flow options, while some only offer pulse flow. When not in continuous flow, all POCs use an electronic conserver that is built into the unit, thus all POCs use a pulse delivery method. Since actual conserve ratios are not provided by the manufacturers, I am giving a rough ratio based on the detailed information of oxygen delivered per breath found at OxiMedical.com. When all is said and done, most people can use the SAME pulse flow setting as they do continuous flow setting. Some find that they need to bump up the setting a notch or two, especially on the smaller POCs that have a 5:1 or 6:1 ratio. Since so many factors contribute to the actual amount oxygen inhaled, the flow setting number is sometimes just a number. The actual amount of oxygen needed is simply what it takes to raise the blood oxygen percentage to an acceptable level as directed by a physician. A fingertip pulse oximeter provides the numbers that are most important. 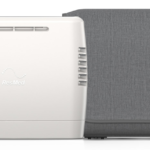 While the Inogen One G3 can be run 24/7, I recommend you have a home unit for your sleeping hours. A home concentrator provides continuous flow oxygen, which is usually recommended by doctors, and also has a more robust motor, which will last longer and allow you to not wear out your Inogen prematurely. The home unit is providing oxygen at a rate of 2 liters per minute, or 2000 mL. The amount of oxygen you actually receive depends on how many times you inhale per minute as well as the length of inhalation, As an example, if you breathe 20 times per minute you inhale once every 3 seconds and would receive about 1/3 of the 2000 mL or 667 mL per minute. The portable unit is providing a pulse flow of setting 4. The number 4 is an arbitrary number set by the manufacturer and the amount of oxygen delivered depends on the conserving ratio used by the manufacturer. For instance, an Inogen One G3 at setting 4 provides 840 mL per minute. The amount of oxygen delivered with each breath will be based on your breath rate so if you breathe faster you will receive less oxygen per breath and if you breathe slower you will receive more oxygen per breath (the unit tracks your breath rate and makes adjustments accordingly). The setting you need can best be determined by using a fingertip pulse oximeter at the various pulse flow settings to see which setting will provide enough oxygen to keep your blood saturated at the level recommended by your doctor. If one uses pulse mode while sleeping, and inhalation becomes less pronounced in deep sleep, what do the POCs do — does the sleeper still get oxygen? All POCs have a built-in No Breath Alarm. Units that offer pulse and continuous flow will alarm, will alarm and then switch to continuous flow mode if no breath is detected. Units that are pulse only will alarm. This alarm usually wakes people up and they will receive oxygen when they begin breathing properly through their nose. The Inogen One G3 will alarm and then switch to auto pulse mode. In this mode, it will deliver oxygen, but it will most likely not be timed with the user’s breathing so very little oxygen may actually be inhaled. Does the use of an Oxy-mask 1125-8 increase the ability of a G3 to provide low flow need during sleep? The OxyMask would not provide sufficient negative air pressure on inhalation to trigger the delivery of oxygen on a pulse-only unit like the Inogen One G3. Masks can only be used with continuous flow oxygen delivery. I have a devilbiss IGo. When using pulse it inevitably cannot detect my inhale and switches to “full” or constant mode. Their tech person suggested I try a flared canula. I did and it did work for about 30 seconds longer before auto switching to constant flow. He advised if it did not work, my inhale was not strong or sudden enough to trigger a pulse delivery. My plumenary doctor agreed this was a likely cause for the performance failure. My question is; if this happens with the IGo will it likely happen with other portable o2 machines and/or canisters? Are there any machines that are more likely to detect my inhales than my IGo? I need O2 for treatment of sleep time sleep apnea. I need O2 for camping out as my business calls for me to be in the field sleeping overnight away from power. Locations for my work are sometimes well away from a place I can use a camping trailor with it’s power source. With regard to your current set-up, how long is the tubing that you are using? If you are using more than 7 feet, I recommend shorting it up to 7 feet while in pulse flow. The less distance there is the easier it will be to trigger the pulse. If your cannula/tubing is already short, then you may want to try the SeQual Eclipse. It has an adjustment for breath sensitivity not found on any other unit. It may work well for you. I have been using a Bonsai POC on tanks and set the LPM at 6 when mowing and such. I just bought an Inogen g2 and when it is set on 6(the cash patient model goes to 6) it is not even close to enough. I don’t think I am an extreme need patient and am surprised the Inogen gives so little Oxygen. I can’t imagine very many people could use the g2 successfully and hate to pay the price if I can only use it when flying. I need a portable for flying and this one will work but is there a better solution? I would like to do away with the tanks and just use a portable concentrator. The Inogen One G2 is the most powerful pulse only unit available. For increased oxygen at the higher pulse settings, a larger, more powerful unit, such as the SeQual Eclipse or eQuinox would be necessary. Thanks Allison. For some reason I never made the distinction about settings on tank conservers as opposed to POC delivery settings. It’s now obvious to me that a regulator like my Easypulse5 at a 4 will be able to deliver more than my G3 POC at 4 on heavier exertion with more frequent breaths per minute. It also tells that when I plan some heavier activity I might want to temporarily go to tanks. I cannot speak directly to your situation but I have found out what helps me when on pulse on a concentrator and getting insufficient oxygen. I learned that I have to slow down a bit, to take deeper breaths and ensure I am using a pursed lips breathing technique I learned in pulmonary re-hab. I get odd looks from people at work and airports but they have no idea. Attitude is everything and I look past the looks and sometime comments. I am confident that most people would just give up put in the situation I am in. I plan on continuing to work and travel with no self imposed end in sight. Best of luck in your situation, and I hope this helps you. Inogen One G3 in about one month. The trip will be from California to Hawaii ( 5 Hrs) so I need to get things correct. Currently I keep my flow setting on either 2 or 3. My Dr. Suggested that it would need to be raised to 4 for the flight. My question, does the increased flow sound like enough given the provided information? Total travel time including layovers and plane change will approach 10 hours. With the airlines required 50% reserve! this would require 3, 16 cell batteries minimum. Are you aware of any cost effective solution other than purchasing $6-700 worth of batteries that likely will not be used again? Thanks in advance for your help. Most people use the same flow setting while flying as they do on the ground since airplanes are pressurized to around 10,000 ft and POCs can maintain the purity of oxygen at that altitude. However, since your doctor must complete a Physician’s Statement for the flight, the airlines will determine battery need based on the flow setting he/she specifies. You may want to look into renting batteries for your flight. I think http://www.oximedical.com will rent batteries for POCs. Look around, you may be able to rent batteries for the trip. If the display says O2 Sensor Fail – See Manual, then it cannot be reset. Since the Inogen One G2 is a pulse only unit it will not provide more than 2 LPM on setting 2. On continuous flow, if a person breathes 2 LPM at one breath every 3 seconds (20 breaths per minute) they would receive only 1/3 of the 2000 mL, or 667 mL per minute. The Inogen provides a maximum of 420 mL at setting 2. Of course, a doctor’s evaluation would be deciding factor. Is there a POC that will deliver 6 LPM on continuous flow? If not how do you convert the 6 PLM to a pulse rate? The highest continuous flow of POCs on the market today is 3 LPM; however, the Oxlife Independence will soon provide 4 LPM. Generally a person would use the same pulse flow as continuous flow, particularly at low flows such as 1 or 2 LPM. However, at higher flow settings for 4 LPM or more, a POC may not be able to keep up with the breathing demand of the user. Thus I would not recommend a pulse only unit such as the Inogen One G2 even though it provides pulse settings up to 6. Instead, a SeQual Eclipse or SeQual eQuinox, which are the most powerful units on the market, would be your best bet for providing high pulse flows. Both units provide continuous flow up to 3 LPM, regular pulse settings up to 6, and super settings up to 9. Ultimately, a fingertip pulse oximeter will be needed to test the patient for adequate oxygen saturation while using a pulse flow on a POC. I am so confused about the POC. I am looking at a Inogen One G3 and trying to figure if it would be adequate for me. I have been prescribed OX for exertion only. I do not need for resting or sleeping. I am currently using a M6 canister with pulse deliver at 2 LPM. I just don’t like hauling all these canisters around and makes me nervous leaving them in the car. Can you tell me if the Inogen G3 would work for me. I counted my breaths and came up with about 17 per minute. It sounds like the Inogen One G3 would be very suitable for your needs. It provides pulse only up to setting 4. At setting 2, the small battery would last 4 hours and the large battery would last 8 hours. However, be sure to purchase your unit from a company that allows you to return the unit without penalty just in case it does not work. OxiMedical offers a no-penalty return within 10 days. I used an Inogen One G3 for 2 years. I do not think it is adequate for anyone who really needs oxygen therapy. And they are completely useless on a airline flight. Since portable oxygen concentrators do not store any oxygen, they do not have a full capacity of oxygen to supply immediately upon start-up. The warm-up is the time during which the machine begins filtering air and concentrating the oxygen. It usually takes only a few minutes for the oxygen to achieve maximum purity; however, most manufacturers allow for 10 minutes for warm-up before alarming in the event there is an issue and the unit does not produce the specified purity. During the warm-up the purity is gradually increasing; however, manufacturers do not provide specification of purity during this time. my mom is 78 years old and she was prescribed a POC ,she uses a 3L/min during wakefulness and 4L/min during sleep. she has a an oxygen machine that she uses when she is in the house but she needs a portable concentrator to use when she goes out . i showed her the simplygo but she thought it was big and heavy for her . do you think the inogen one g3 is good for her? It sounds like the Inogen One G3 would be a good fit for your mom. It provides up to pulse setting 4 and weighs 5 pounds, so it should provide enough oxygen for her needs and be light enough to carry (it’s half the weight of the SimplyGo). Be sure to find a good dealer that will let you exchange or return the unit if it does not work for her. I’m in the process of buying the above POC as I suffer from COPD and require it so that I can travel into the Drakensberg Mountains, and up to Johannesburg which is 6000’-00” above sea-level, where there is 20% less oxygen in the air. There appears to be a minor problem in that I am now trying out my second POC of this type, and find that when I come under stress, ie walking up hills, riding an exercise bicycle the green light and the puff of oxygen frequently occur at the wrong time, on occasions when I’m still breathing out. I tend normally to breathe slowly and reasonably deeply as I used to play rugby, and having resided in Johannesburg I found that this was the best method to breathe. Shorter breaths leads to panting etc while the longer deeper breaths assist to control my pulse rate. I’m now 77 years of age and suffer from COPD and AF which is under control. At sea level where we currently reside, I can manage fairly well but the heat and humidity does cause me some problems. As this is the second trial new machine I conclude that I must be doing something wrong. Also note that after cycling on the exercise bicycle with virtually no load on the pedalling, with the POC set at 3, I finish after 5Kms and walk through to the lounge and check my O2 % and pulse rate. The O2 % was 92/93 pulse in the mid 80’s I can also achieve those figures without the POC but as I stated I require assistance oxygen when I leave the coastal area of try to rush myself. Can you please consider this matter and possibly advise me as all comments would be most helpful. Your Area Staff are excellent and provide a great service but as this is the second attempt I thought that perhaps the Manufacturer’s would be of assistance to me. If the conserver is triggering falsely only occasionally then there is nothing to be concerned about. However, if it consistently triggers falsely then it is possible that the unit has a faulty trigger sensor. The best test of POC efficacy is satisfactory blood oxygen levels; however, since you are able to achieve good O2 % without the unit, we really won’t know for certain if the unit is working properly until you are able to travel to high altitude environments. non portable unit for in the house. I maintain a reading on my pulse ox of 93 -94 ata setting of 3 or so on my stationary machine. Will the G2 supply me with an equivalent amount? The Inogen One G2 is a pulse only unit that provides up to setting 6. You may need to use the Inogen One G2 on a higher setting than you do with a continuous flow unit, but it has enough higher settings to accommodate that. Certainly check with your doctor, but it sounds like the Inogen One G2 would easily provide sufficient oxygen for your needs. I have pulmonary hypertension and need nocturnal oxygen at 2L/m. I will be travelling overseas and my doctor will complete the physician’s statement required by the airline. I would also like to get your opinion as to whether I can travel using a pulse dose POC and at what setting. If you think yes, would Inogen 1 be a good machine for me to purchase? The key to being able to use a pulse flow is the ability to trigger the pulse by breathing through your nose. Most people have shallow breathing while sleeping or breathe through their mouth and are not able to consistently trigger the pulse while sleeping. However, others do just fine. Knowing your breathing habits while sleeping and discussing it with your doctor will assist you in making a decision. If you are able to use a pulse flow unit, then yes, the Inogen One G2 or G3 are good models. If you need continuous flow, then I would recommend the Respironics SimplyGo. I have a 7yr old niece (who only weighs 30lbs) with CF that is on 24hr oxygen. Right now for portables she has to carry around the cylinder tanks with a pulse regulator (set at 3). Not sure if the pulse flow settings on a POC would be the same. At night she’s on continuous flow of 3lpm. Would a POC work for her? I would really like to get her one as her insurance won’t get her one. It’s easier to carry an extra battery around instead of extra tanks. A POC should work just fine for her since she is already used to pulse flow. You’ll want to check the amount of oxygen per breath that her conserver (pulse regulator) is delivering and compare it to what she would receive at the same setting on the POC you choose. You may have to increase the flow setting on the POC to get the same amount of oxygen. Since you have a tank that can be used on pulse flow, I recommend practicing with that for several weeks before you invest in a portable oxygen concentrator. You should be able to determine within a couple weeks whether you can get used to pulse flow. As for the SimplyGo, yes it is 10 pounds, and I expect it to be difficult for you to carry for more than a few minutes at a time. However, it does come with a wheeled cart so you would be pulling it along more often than carrying it. You may want to try pulling a small suitcase to see if it is too heavy for you. The new SimplyGo Mini is only 5 pounds (half the weight), but it provides pulse flow only and does not provide continuous flow at 2 LPM, which you may need for overnight travel. The battery for the SimplyGo last 3.5 hours on setting 2 pulse, but you’ll need extra batteries for travel, especially for flying. Keep in mind that you can use the DC adapter when traveling by car so you don’t have to worry about the battery draining while you’re driving. Airlines require 150% of flight time in battery power, so if you have a 4 hour flight you would need 6 hours of battery time. I recently got an Inogen G3. My question has to do with sleeping at night. I can set the machine at two or three lpm but when my breathing gets slow and peaceful, the Inogen does not adjust to this low intake and fires off the alarm. Is there a way, like a special sensitive canula, that would help? You may want to try a flare-tipped cannula. This cannula flares out at the ends, filling your nostrils better, resulting in a more sensitive trigger. Many people find this cannula helpful. If your unit continues to give a no-breath alarm with this cannula, then you will have to switch to another model that provides a continuous flow. 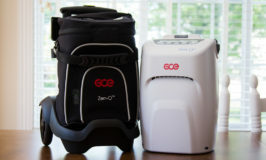 Yes, the OxyGo is an Inogen One G3 that has been privately labeled for the company that sells them. Hi Allison, thank you for your blog and helpful answers. I use 2lm oxygen concentrator while sitting and 4lm while walking. I want to travel abroad and would like to hire a pulse oxygen concentrator. I am doing about 42 breathes walking and 26 sitting. Could you help to choose which POC ll be ok for me to hire? I am looking at inogen 2. The companies i contacted just say it gives 4 lpm on setting 4 as i need, but reading your blog i understand it doesnt work that way. The Inogen One G2 is the most powerful unit under 10 pounds; however, it may not keep up with your breathing rate while walking. It will consistently produce 840 mL per minute on setting 4, giving 42 mL per breath on setting, but only 21 mL per breath on setting 4. It also provides only a pulse flow and may not be suitable to use while sleeping. It certainly is more convenient to use a smaller unit so you may want to rent a unit for a few days or a week before you travel to test it out and see if it will work for you. If the Inogen One G2 does not work, then you will need a larger unit like the SeQual Eclipse 5. It can easily handle your faster breathing rate at the higher flow setting. The drawback is the weight and size – it is 18 pounds. Dear Allison, thank you very much for your answer. Your posts in your blog saved me a lot of money. Only here i could find the correct information about POC. Hi Alison, I’m doing research for a novel and would love some expert help! Am I right in thinking that the Inogen One has a light to indicate breathing? In other words, does the light flash with each breath? If not, do you know of any other POCs that do? Breath Detection Alert Mode. 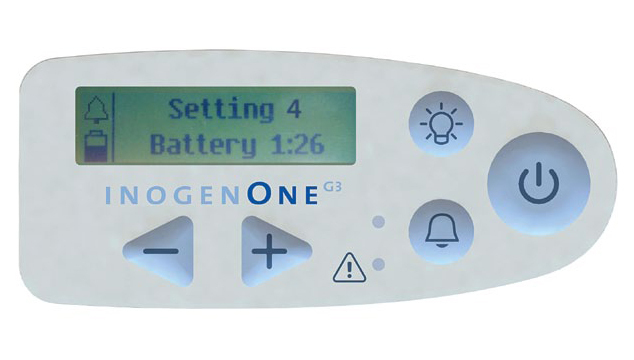 The Inogen One® G3 will alert with audible and visual signals for “no breath detected” when this mode is enabled and no breath has been detected for 60 seconds. At 60 seconds, the device will enter into auto pulse mode and once another breath is detected, the device will exit auto pulse mode and deliver normally on inspiration. The display’s mode indication area will show a bell icon, flashing red light and display message when the alert is enabled. You are a star, Alison!! Thanks for your help. I have ordered a Respironics SimplyGo for my wife. She is currently on the bottled oxygen and uses a setting of 3 for continuous flow and pulse. We would only be able to use this machine on pulse mode. On their site they state that this unit will work with up to 30′ of oxygen tubing. It does not say whether this is for continuous floe only or not. They also state not to use with an extension cord for power. Our problem is we do not have power outlets close enough to use without needing either a 10′ heavy duty extension cord or a 7′ nasal cannula with 5′ more tubing added ( 12′ total ). Could we get buy with a short heavy duty extension cord without hurting anything? If not, do you think a short 5′ extension added to her 7′ nasal cannula would work on the 3 pulse setting? Since the manual does not explicitly limit the 30′ oxygen tubing to continuous flow, I would think it can be used for pulse flow as well. I see no problem with your wife using 12′ cannula/tubing. I also suspect the use of a heavy duty extension cord would not be an issue; however, this question is best answered by the factory since they are the one’s who decide your warranty coverage in the event damage is incurred. I am oxygen dependent while sleeping and with any exercise. I use a stationary O2 concentrator @ 2L with my Bipap while sleeping, because of sleep apnea and pulmonary hypertension. I also have emphysema and use a M 6 tank with walking exercise @ 5L pulse dose. I would like to have a POC that would serve my purpose for exercise and also traveling, especially for night use. What POC do you recommend for me? The POCs that would meet your oxygen needs are the SeQual eQuinox, SeQual Eclipse 5, or the Oxlife Independence. All of these provide up to 3 LPM continuous flow and 6 or more on pulse flow. I am nervous about taking first flights with POC. I have the Inogen One G3 and plan on taking 2 back to back 3 1/2 hour flights from San Francisco to Philadelphia. I have 2 four hour batteries and just spoke to the Inogen support staff about buying extra batteries. One person recommended I buy the new 9 hour battery while another recommended just buying an extra four hour battery and taking all 3 with me to make sure i have the 150% capacity required. Do you have any advice? Normally I use oxygen only at night at rate of 2. But i know traveling for hours at the limited oxygen in aircraft can trigger more trouble in breating? For a total of 7 hours of flying you need 10.5 hours of battery time. If you will be using setting 2, then the larger battery will last 9 hours but is still not enough by itself to meet the requirement of 150% of flight time in battery capacity. Therefore, you would still need to bring at least one of your smaller 4-hour batteries for a total of 13 hours. Alternately, if you purchase another 4-hour battery, you would have a total of 12 hours, which would meet the requirements. The choice is based on your personal preference considering cost, the number of total batteries you want to bring with you (1 large and 1 small vs 3 small), and whether you would have use for the larger 9-hour battery in the future. My 82 yr old dad has Pulmonary Fibrosis. Lung capacity at 78%. now using Eclipse POC with continuous 1-2 LPM. (increase to 2 LPM with activity) doing well with O2sat 94-98%. He wants to try a pulse, but I am concerned that the pulse mode will not maintain his O2sat above 95%, especially with activity. He wants to look at the Imogen G3 or G4. He often has to be reminded to nose breathe vs huffing via his mouth. Do you have any input for how pulse vs LPM will be effective? Your dad’s oxygen requirements are low so as long as he learns to breathe through his nose he should do well with pulse flow. Since the SeQual Eclipse that your dad already uses has pulse flow settings available, it would be easy to try pulse flow (under the care of his physician) before investing in another unit. Effectiveness is measured with a fingertip pulse oximeter. Keep in mind that the Eclipse provides the greatest amount of oxygen per breath at each pulse setting and a 2 on one model is not the same as a 2 on another model. While your dad may do quite well with the Eclipse on pulse setting 1 or 2, he may need a setting 3 or 4 on a pulse only unit like the Inogen models, which provide smaller amounts of oxygen at each setting. My mother has an Inogen One G2 that goes up to 6. She is currently on 4 continuous. Given that the Inogen is a 5:1, are you saying that if she used the [email protected] at a rate of 5 that she would probably get as much oxygen as she does at the rate of 4 continuous? I’m not interested in the time while sleeping, but rather during the time driving in a car or pushing a cart in the store. If an oxygen user breathes 20 breaths per minute on 4 LPM continuous they would receive about 1/3 of the total 4000 mL being produced, about 1333 mL per minute. The G2 provides 1050 mL per minute on setting 5 and 1260 mL on setting 6. Neither of these quite reaches 1333 mL, although most people can use the same setting, or one setting higher, on pulse flow as they do on continuous flow. What a personal actually inhales is dependent on many factors including breath rate, the length of inhalation, timing of the pulse oxygen in relation to inhalation. There is no way to determine the exact setting that will be sufficient to keep blood oxygenated without the use of a fingertip pulse oximeter. The reading on an oximeter is the number that tells you the full story. I have large continuous flow oxygen machine in home. I have 35 ft tubing, as I can move about in my home. I have it set at 3 pm, however I do better when its set to 3 1/2. Is this due to the length of the hose. Most home concentrators can provide optimal levels of oxygen with up to 50 feet of tubing so 35 feet should not be a problem. If you do better at 3 1/2 it’s possible you simply need more oxygen. Check with your physician or respiratory therapist to be certain. I have used a variety of Portable Oxygen Concentrators with mixed results. I find that the world at large is not as aware as we should be inasmuch as the dialed in setting does NOT necessarily correspond to the the LPM flow rate – an important item you first published several years ago. Currently I am using LOX, and have vessels at home that get refilled 2x monthly, and a Helios Marathon 850 for my portable use. The Helios Marathon has an option of “On Demand” vs. Continuous flow. I do not believe, however, that either of the numerical values directly relate to the LPM flow rate, but are merely close (closer than a POC) rate published with the various OEM data . . . While walking, you are probably breathing faster than the Inogen is able to keep up at that setting. In other words, you are out-breathing the machine. I recommend you take your Inogen to your doctor and use it while doing a 6-minute walk test. I look forward to hearing back from you after you visit your doctor. I don’t know anything about POC’s but purchased a SeQual Eclipse 3 for my Aunt who recently passed. I have listed the POC for sale and the buyer asked me if it can go to 9 on Pulse. The POC does not list a Pulse dose setting higher than 6.0 at a Bolus Size of 96. The chart list Bolus Sizes up to 192 but no Pulse Dose beyond 6.0. What is the relationship of Pulse Dose to Bolus Size, and does the Bolus Size of 192 equate to Pulse Dose of 9? SeQual programmed the unit to only show bolus size at the higher settings on the display screen, but the bolus size of 192 mL is the equivalent to pulse setting 9 so you can tell the buyer that the unit does indeed go up to setting 9. Are there any POCs that use the demand delivery method? I’m currently on 5-6 lpm continuous flow, mainly because I cannot breathe effectively through my nose due to sinus & allergy issues. Previously, when I was on a lower dose of oxygen, I used the Respironics SimplyGo until I reached the point where I was continually out breathing the machine, at which point I was put on the E size tanks at my current usage. I was wondering if I used a mask with a demand or a hybrid machine if it would detect my inhalation through a mask (which I believe I could do at a lower pulse rate & keep my saturation level up)? There are models that provide pulse (on-demand) delivery of oxygen. However, using a mask would not provide enough negative air pressure to trigger the delivery of oxygen. Masks can only be used with continuous flow oxygen delivery. Unfortunately, using a pulse delivery requires effective breathing through a nasal cannula. I cannot advise flow settings as this is determined by your physician; however, it is likely you need to use whatever setting allows you to remain saturated at a satisfactory level. I am buying an Inogen One G4. and concentratror for home use I was doing the 6 minute walk test and it dropped down from 90 to 89. Another time I did it was only 87 . When my breathing dropped to 89 she stopped me and put me on an oxygen tank and I still had trouble breathing but it remained at 90. what does level 2 mean it is it enough oxygen: Is Inogen G4 and the home concentrator enough for me? Level 2 is an arbitrary number set by the manufacturer. It is not equivalent to 2 LPM and is not the same from one POC model to another. On the Inogen One G4, it means you are getting 420 mL per minute. As a point of reference, if you breathe 20 breaths per minute on a continuous flow of 2 LPM you would receive about 667 mL per minute. If the setting 2 on the G4 is not providing you with enough oxygen then you may need to test at setting 3 or get with a more powerful model like the Inogen One G3 which provides 5 pulse settings. I have a OXYGO (1400-1000) and I would like to know if it is set on a higher flow setting (I am on 2lpm now) does the increase in lpm affect the length of the battery time. I have never tested the battery length but I know I am getting over 4 hours now. Yes, the increase in flow setting will decrease the battery time. Roughly, the large battery will decrease about 1 hour and the small battery will decrease about 1/2 hour with each increase in flow setting.